Chapter 13.1-7 of Paul’s Letter to the Romans has been highly controversial and is a good subject for a lively conversation on just how Christians should view the government. The Christians that Paul is writing to lived in Rome, the capitol of the world’s biggest empire. Christians claimed that “Jesus is Lord,” the title that the Roman emperor, seen as a divinity, required. Could one say both “Caesar is Lord” and “Jesus is Lord?” Paul would say no, “there is one Lord, Jesus Christ.” So was simply being a Christian an act of sedition against the state? The idea of forgiveness is so ingrained in our cultural and religious traditions that it is easy for us to overlook what an extraordinary idea it is. Although we tend to separate out “forgiving” and “forgetting” the biblical notion of forgiveness is literally “a forgetting,” in that after the act of forgiveness “it is as if ” the grievance never happened. It is only the aggrieved party who can do the forgiving, and the act of forgiveness “wipes away” the memory of the grievance so that it no longer has any influence on the relationship. So it is that the phrase “I will remember their sins no more” appears again and again in the Bible, for example, in Isaiah, Jeremiah, and Hebrews. Before this idea of forgiveness took hold there was simply “revenge,” in which affronts were met with retribution, often disproportionate to the original wrong. These “family feuds,” if we want to call them that, could go on for generations, and still do, as we see sometimes, for example, in the Middle East, where memories of affronts are long. But the idea of forgiveness moves social relationships into a whole new key, and goes beyond mere justice. Indeed, forgiveness is an affront to justice, which is one of the perpetual accusations made against the Gospel by its critics. So God does not forgive the people and punishes them with a flood. God shows some mercy, enough to save a remnant in the ark, the blameless Noah and his family, and the several species of animals. But God repents of his action, viewing it as a dry run (if you’ll excuse the pun), and promises never to do it again, laying down his arms (so to speak,) and leaving his bow in the sky to remind him. Now this passage is really packed with things to ponder, but I want to highlight three for you. 1. First, this is a big moment in the history of God and his people. The revealing of the divine name tips us off to it, and right after this is the giving of the law and the Sinai covenant. To reveal one’s name is to be in relationship. God chooses to be in relationship with Israel, and renews the previous covenants. 2. Second, while we in our day tend to focus on the individual, and on individual sins, notice that here the emphasis is collective to the people as a people. 3. Third, the relationship is not only collective it is trans-generational, the promise applying across multiple generations. I would guess that most of what we talk about in this Lenten study over the next few weeks will be about individual acts of forgiveness applied to willful, intentional sins. But the early understandings of forgiveness in the Bible were almost always collective, and almost always for inadvertent sinning. So I need to say a word about why divine forgiveness was a necessary condition for God and Israel to be in relationship. This is a little hard for us to get our minds around because we tend to think of sin as a moral category, and it was also for Israel. But sin was frequently, perhaps even more frequently, thought about not as morality, but as purity. 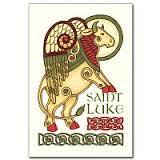 God was understood to be holy and humans were not, the creator and the creatures were in different categories. And so we see the development of the elaborate holiness codes in Leviticus, which were designed to produce ritual purity in people so as not to offend God. Even so, it was impossible to keep all the myriad laws required. Remember I said most sins that needed to be forgiven were inadvertent. So it wasn’t flagrant sinning like robbery, murder, or adultery, the ones we think of in moral categories, which needed to be forgiven so much as the infractions against ritual purity. This is part of the backstory behind some of Jesus’ conflict with the scribes and the Pharisees who were zealous for the law, the maintaining of ritual purity. I don’t think I am stating it too strongly to say that our very humanity makes us in need of forgiveness from the God who is holy. And that is why when God chooses to be a forgiving God it is a precondition for us to be in relationship with God at all. And again, I think if we look at the grand arc of the whole Christian Story in the scriptures of the Old and New Testaments we see how the very identity of God can be understood in terms of forgiveness, the fruits of mercy and love. So much so that, after Good Friday and Easter, the early disciples of Jesus, all of them Jewish, as he was Jewish, came to call him “Lord,” the name previously reserved for God alone. It is quite remarkable. They saw in his love, mercy, and forgiveness congruence with the character and indenty of their God. All these understandings about God’s holiness get carried into the Christian era, so the New Testament also understands sin as an offense against God’s holy law or against another human being. As in the Old Testament forgiveness involves the wiping from memory of the offense by the one affronted so as restore harmony in the relationship. Our best example of forgiveness at work is in “The Parable of the Prodigal Son,” (Luke 15:11-32) which I know some of you have been studying. One of the key features of that story is the father’s eagerness to restore his relationship with his lost son. 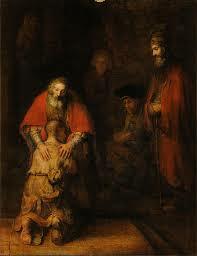 Notice the father forgives the prodigal before the son even has time to deliver his little repentance speech. We should recall that the whole purpose of forgiveness is the restoration of the broken relationship. And in this parable the older brother, who didn’t leave, didn’t sin, and kept all the rules, thinks it is unfair that his deadbeat brother is restored. And it is unfair, because forgiveness is driven not by justice but by love. The older brother thinks he has earned his father’s love by his own achievements. But you don’t earn love. The father loves the prodigal not because he is good, but because he is his. I’d like to quickly point to two more features of the New Testament idea of forgiveness. The first I have mentioned already: the death of Jesus, which in miniature focuses the whole gospel story. Here the sinless faithful Messiah, betrayed, denied, and abandoned by sinful humanity, obediently goes to his death with forgiveness on his lips, praying to his Father for forgiveness for those who killed him. It is a loving act of atonement. The second feature, which will come up in our questions, is the way Jesus taught his disciples to pray about forgiveness in the Lord’s Prayer: “forgive us our trespasses (debts, sins), as we forgive those who trespass against us.” Here, and elsewhere, Jesus is saying that the capacity to receive forgiveness is somehow intimately connected to our capacity to forgive. In Matthew 5:23-24, for example, Jesus says, “So when you are offering your gift at the altar, if you remember that your brother or sister has something against you, leave your gift there before the altar and go; first be reconciled to your brother or sister, and then come and offer your gift.” It is as if only those who can forgive can understand it enough to receive it.